Dental implant related research published by Dr. Dan Holtzclaw has now been cited by over 300 different articles published in dental literature. "Having my dental implant research cited by over 300 different peer reviewed articles written by hundreds of authors is a great honor." Dr. Dan Holtzclaw, a dental implant surgeon with offices in Austin, Texas and San Antonio, Texas recently had his research cited by a 350th article in dental literature. With more than 50 scientific articles published in peer reviewed dental journals such as the Journal of the American Dental Association and the Journal of Periodontology, Dr. Holtzclaw is one of the most highly published dental implant clinicians in the United States. To date, his research has focused on dental implants, All-On-4™ style dental implant treatment, amnion-chorion barriers, bone grafting, sinus lifts, and other various dental implant related topics. Dan Holtzclaw, DDS, MS is a board certified periodontist who specializes in traditional and complex dental implant surgery. 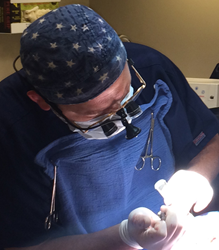 Dr. Holtzclaw is the lead dental implant surgeon for DIA Dental Implant Centers. DIA Dental Implant Centers currently run both the Austin Dental Implant Center and the San Antonio Dental Implant Center. Dr. Holtzclaw is an internationally recognized expert on the All-On-4™ immediately loaded dental implant procedure, the NeoArch® immediately loaded dental implant procedure, sinus bone grafting, mandibular ridge splitting, periodontal bone grafting, and amnion-chorion allografts. Dr. Dan Holtzclaw has published more than 50 scientific articles on these topics in industry leading journals such as the Journal of the American Dental Association, the Journal of Periodontology (official journal of the American Academy of Periodontology), Implant Dentistry (official journal of the International Congress of Oral Implantologists), General Dentistry (official journal of the Academy of General Dentistry), and the Compendium of Continuing Dental Education. For more information about Dr. Dan Holtzclaw and the services or lectures he offers, visit his websites http://www.austindentalimplantcenter.com or http://www.drdanholtzclaw.com. All-On-4™is a registered trademark of Nobel Biocare®. While Dr. Dan Holtzclaw has lectured for Nobel Biocare® on numerous occasions and the company has featured him and his surgical procedures in their brochures/advertisements, Nobel Biocare® does not endorse/sponsor Dr. Dan Holtzclaw. NeoArch™ is a registered trademark of Neodent®. While Neodent® has featured Dr. Dan Holtzclaw and his surgical procedures in their company media and has had him provide lectures for the company, Neodent® does not endorse/sponsor Dr. Dan Holtzclaw.